While many client devices use solid-state storage technologies nowadays, hard disk drives (HDDs) are still used by hundreds of millions of people and across virtually all datacenters worldwide. Heat-assisted magnetic recording (HAMR) technology promises to increase capacities of HDDs significantly in the coming years. Unfortunately, mass production of actual hard drives featuring HAMR has been delayed for a number of times already and now it turns out that the first HAMR-based HDDs are due in 2018. Analysts from International Data Corp. and Western Digital Corp. estimate that data storage capacity shipped by the industry in 2020 will total approximately 2900 exabytes (1EB = 1 million TB), up from around 1000EB in 2015. 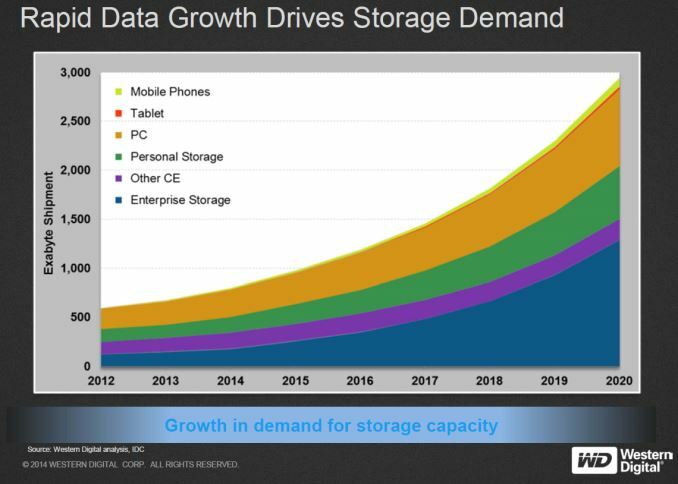 Demand for storage will be driven by various factors, including Big Data, Internet-of-Things, user-generated content, enterprise storage, personal storage and so on. Samsung Electronics believes that the NAND flash industry will produce 253EB of flash memory in 2020, up from 84EB in 2015. Various types of solid-state storage will account for less than 10% of the storage market in terms of bytes shipped, whereas hard drives, tape and some other technologies will account for over 90%, if the estimates by IDC, Samsung and Western Digital are correct. In a bid to meet demand for increased storage needs in the coming years, the industry will need to expand production of NAND flash memory as well as to increase capacities of hard disk drives. Modern HDDs based on perpendicular magnetic recording (PMR) and shingled magnetic recording (SMR) platters have areal density of around ~0.95 Terabit per square inch (Tb/in²) and can store up to 10TB of data (on seven 1.43TB platters). 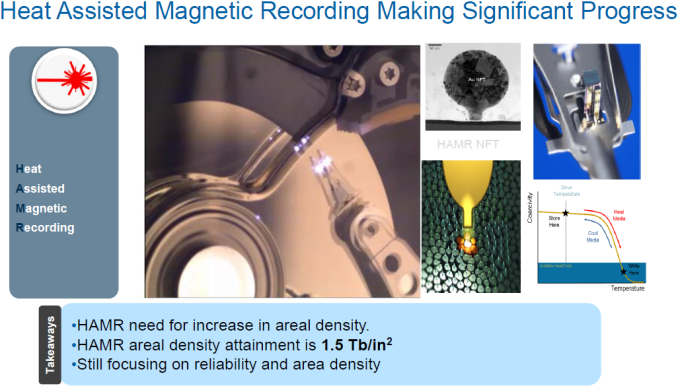 Technologies like two-dimensional magnetic recording (TDMR) can potentially increase areal density of HDD disks by 5 to 10 per cent, which is significant. Moreover, Showa Denko K.K. (SDK), the world’s largest independent maker of hard drive platters, has outlined plans to mass produce ninth-generation PMR HDD media with areal density of up to 1.3Tb/in² next year. Companies like Seagate Technology and Western Digital believe that to hit areal densities beyond 1.5Tb/in², HAMR technology along with higher anisotropy media will be required because of supermagnetic limit (physical “pitches” on optical media become so tiny that it will not be possible to produce a powerful enough magnetic field in the HDD space to write data into them). Certain principles of heat-assisted magnetic recording were patented back in 1954, even before IBM demonstrated the very first commercial hard disk drive. Heat-assisted magnetic recording technology briefly heats magnetic recording media with a special laser close to Curie point (the temperature at which ferromagnetic materials lose their permanent magnetic properties) to reduce its coercivity while writing data on it. HAMR HDDs will feature a new architecture, require new media, completely redesigned read/write heads with a laser as well as a special near-field optical transducer (NFT) and a number of other components not used or mass produced today. According to Seagate, its HAMR heads heat media to approximately 450°C using a laser with 810nm wavelength and 20mW power. The company does not disclose any details about its HAMR recording heads because they are the most crucial part of the next-generation hard drives. HDD makers, independent producers of recording heads, universities and various other parties have researched HAMR heads for years. NFT is a very important components of any HAMR head. It has to deliver the right amount of energy into a spot diameter of 30nm or smaller. NFT also has to be durable and reliable, which is something that many researchers are working on. This month Showa Denko disclosed its roadmap for next-generation hard drive media. While such plans tend to change as products get closer to mass production, at present SDK expects its first 2.5” platters for HAMR drives to feature 1.2TB – 1.5TB capacity (areal density of 1.5Tb/in² – 1.95Tb/in²). 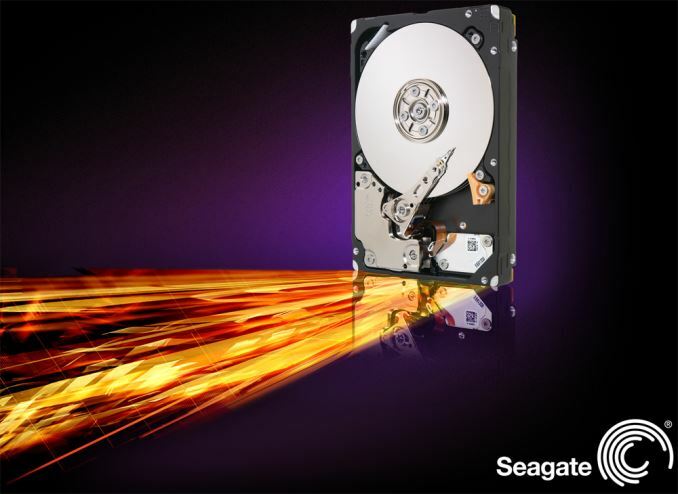 By the end of the decade, capacity of 2.5” disks for HDDs is projected to increase to 2TB. Showa Denko’s forecasts clearly show the benefits of HAMR technology and its potential. Manufacturers of hard disk drives, heads and HDD media have been working on technologies to enable HAMR-based HDDs for well over ten years now, as soon as they realized that at some point HAMR technology would be required to build hard drives with higher capacities. Starting from mid-2000s, various manufacturers of HDDs have demonstrated prototype HDDs that used HAMR technology for a number of times. 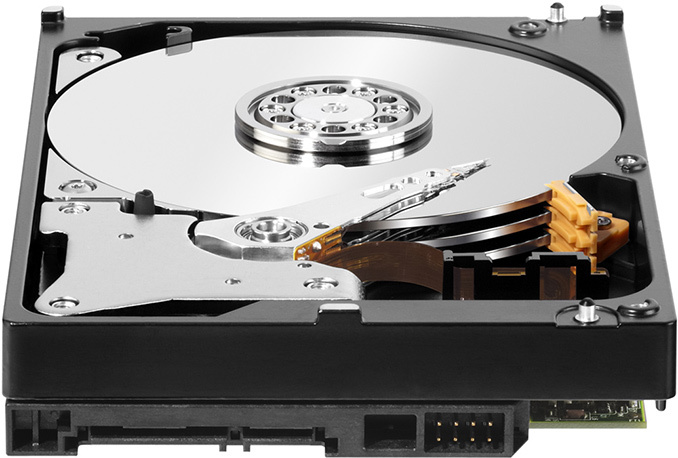 For example, Western Digital showcased a 2.5” hard drive that used HAMR tech back in late 2013. In mid-2015, Seagate displayed a NAS powered by multiple drives featuring heat-assisted magnetic recording. Numerous demonstrations of HAMR-based HDDs in action prove that the technology actually works. Over the years, producers of hard drives, platters and recording heads have revealed various possible timeframes for commercial availability of drives with HAMR technology. Their predictions were not accurate. At present, there are still reliability issues with the technology, according to Seagate. In the recent months both Seagate and Showa Denko indicated that HAMR drives would be delayed again. Seagate plans to ship prototypes of its HAMR-based drives to select customers in late 2016 or early 2017. The drives will be intended mostly for test purposes. They will help Seagate and the company's clients to understand how reliable the HAMR-powered HDDs are in actual datacenters, whether they are compatible with existing infrastructure and how fast they are in real-world applications. Evaluation will take a long time and chances that Seagate starts volume shipments of hard disk drives with HAMR technology in 2017 are low. Last week Showa Denko also said that its platters for hard disk drives that use heat-assisted magnetic recording technology would be delayed to 2018. “As for new generation technologies, HAMR or TAMR, the start of mass production will be [slightly] delayed to 2018,” said Hideo Ichikawa, president of Showa Denko. The official mid-term business plan of the company reads that the new-generation media "will be launched in or after 2018". While it is evident that HAMR-powered hard drives are not ready for prime time, producers of HDDs do not reveal the nature of the issues. 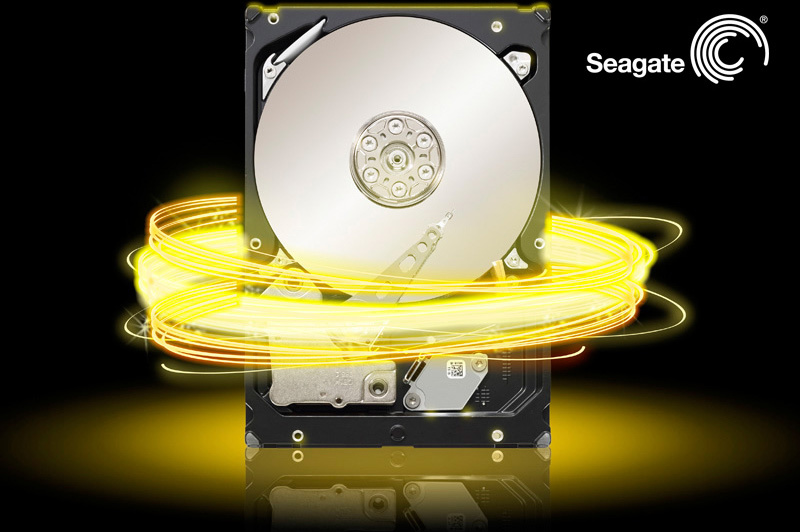 Seagate indicated earlier this year that HAMR-based drives were not stable enough, but did not elaborate. Even though HAMR seems to be at least two years away, hard drive makers will continue to increase capacities of their flagship drives going forward. SDK promises to start volume production of its ninth-generation perpendicular magnetic recording platters next year. So far, the company has announced that the ninth-gen PMR disks for 2.5” HDDs will feature 1TB capacity. Eventually the tech could be applied to 3.5” platters to increase their capacity up to around 2TB. Earlier this year Seagate introduced its 2TB hard disk drive in 2.5” form-factor that is just 7mm thick. The drive is based on two 1TB platters, which feature leading-edge 1.3Tb/in² areal density. The same technology will inevitably be used for 3.5” HDDs, enabling Seagate to introduce enterprise-class hard drives with over 10TB capacity in the coming years. Western Digital Corp. builds high-capacity platters in-house. While exact plans of the company are unclear, its HGST division has consistently offered the world’s highest-capacity hard drives for several years in a row now. 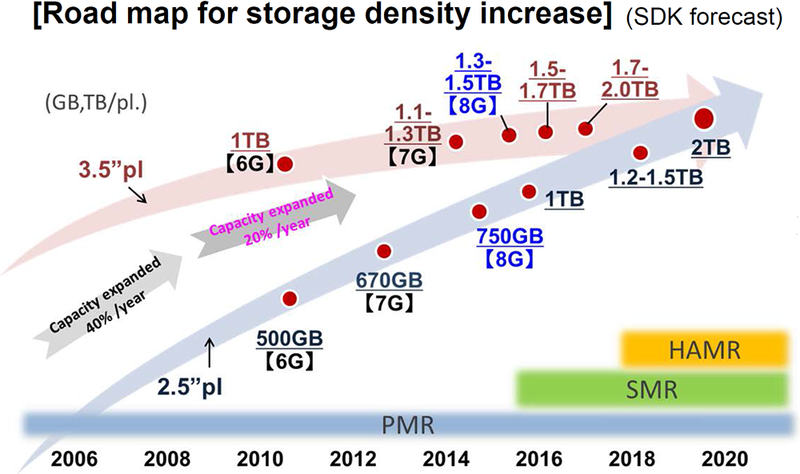 Overall, while HAMR faces another delay, leading producers of hard disk drives will be able to expand capacities of their HDDs using PMR and SMR platters in the coming years. Yep. For bulk archival storage HDDs have a future, but outside of that, who would use it? Most companies just need 2-5TB of storage, with a far greater need for IOPS than greater storage. When looked at a $/IOPS standpoint (not to mention power consumption, reliability, etc.) the SSDs are much cheaper than HDDs. Still lots of market for cheap bulk storage though, so the HDD market is not going to disappear any time soon. Well, will these be as fast as flash/ssd storage in 2018? Seek times are irrelevant when it comes to multi media. If you don't care about money, then SSD can and does offer more density for a given size. For example, how many 1TB mSATA/m.2 drives can you fit into the same space as an 8TB 3.5in HDD?